ATOM is a Lightweight, powerful, silent, fumeless, smart solar generator. With the option of a solar panel it can utilise clean, green energy from the sun to recharge it’s lithium battery. ATOM is easy to pack and light to carry, so your electronic equipment can always travel with you on every adventure. ATOM quickly recharges from a mainssupply in approximately 4/5 hours or from the sun in approximately 8/11 hours using the 60w solar panel. VERSATILE - ATOM can be adapted to many different outdoor uses or activities with the added option of two different size power cells. An option of 60,000mAh or 78,000mAh are available, meaning that ATOM can be used in most situations from short day excursions to longer field trips. Not only that but it’s ideal for home use (power cuts), camping, daily use, when on the move (touring), or in times of emergencies. INTELLIGENT- ATOM is equipped with an easy read User Information Display (UID). The digital display indicates current battery level and usage information including outlet's selected and power consumption. ERGONOMIC- ATOM was designed for maximum portability with a stylish comfortable handle allowing ATOM to be transported and used with ease. ATOM also has an integrated LED torch which is operated by a small button on the handle to illuminate your way. 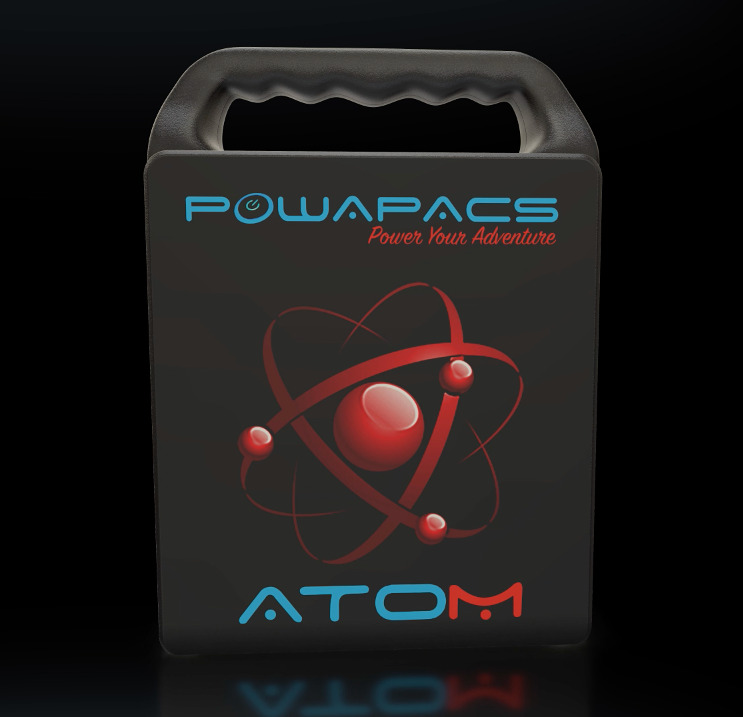 UNIVERSAL COMPATIBILITY- ATOM contains 4 fast charge USB ports, 1 x AC outlet and 1 x 12v cigarette type outlet. ATOM is compatible with electronic devices including mobile devices (Apple, Samsung, Google, Android), Laptops (Apple, Dell, Toshiba, Asus, HP),photographic equipment, search & rescue equipment, lights, television, stereos, iPhone, iPad, CPAP machines, medical devices, printers, flat screen TV's, PS4, Xbox One, Wii U and drones to name a few. Please check that your device is compatible with the 150 watt surge protector rating. QUICK CHARGE, HIGH CAPACITY - ATOM has a quick charge high capacity design that quickly recharges and powers your electronic devices. Atom's 60,000 mAh capacity is built using 30 x 2,000 mAh Panasonic battery cells and 78,000mAh using 30 x 2.600 mAh Panasonic battery cells. ADAPTABLE RECHARGING- Whether you're at home, work or out and about, there are plenty of easy ways to recharge your ATOM. Take your pick and recharge your way! There are three ways to charge your ATOM 1. Via the Sun using a Powapacs 40w/60w Solar Panel, 2. Via the wall charger, or 3. Via a 12-24V car adapter! 4 x 5v 3.1 amp USB outputs(Auto power detection). Battery - High discharging rated 18650 lithium battery. Capacity's - 60,000mAH 240Wh -78,000mAh 312Wh. Mains charging time - 15V 4A approx 6 hours. Solar charging time - 8 -11 hrs using high output 60W SUNPOWER solar panel in optimal light conditions and at 45 degrees placement.